Mary was the first of her parents’ children to survive more than a few weeks, and was thus doubly precious to them, both as a living daughter, and as a sign of brothers to come. Born at the favoured palace of Placentia, Greenwich, she was baptised a few days later at the Church of the Observant Friars. Her godmothers were her great-aunt, Katherine of York, Countess of Devon, and Lady Margaret Plantagenet, Countess of Salisbury. Her father’s chief minister, Cardinal Wolsey, was godfather. Almost as soon as Mary was born, she became a valuable pawn to be used in the complex negotiations that Henry VIII and Wolsey carried out to maintain the balance of power in Europe – playing off François I of France against Mary’s cousin, Charles, King of Spain. Aged two, Mary’s first appearance on the European stage was at her betrothal to François I’s oldest son, the Dauphin. Dressed in cloth of gold, she was held up by Cardinal Wolsey as the massive diamond betrothal ring was placed on her baby finger. 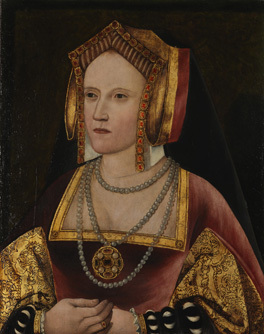 At the time, Mary’s mother, Katharine of Aragon, was pregnant, and, optimistic that the coming child would be a boy, Henry had agreed with the French that, should Mary be his only child, she would inherit the throne. Unfortunately for both Henry and Katharine, the Queen’s last pregnancy ended in another loss. The Venetian ambassador believed that, had Henry thought there was a real prospect of Mary inheriting, he would not have gone ahead with the betrothal. Nevertheless, the agreement continued, and two years later, still promised to the Dauphin, Mary was left in nominal charge of the kingdom as her parents travelled to France to the Field of Cloth of Gold. In their absence, the French sent ambassadors to see her – presumably to check on her health and appearance. Apparently, Mary spoke up prettily and asked for strawberries to be served to the visitors. Her prospective mother-in-law, Queen Claude, also sent personal messengers to enquire after her. Mary's education was the best available in the early 1520s to enlightened parents who were both well-educated themselves and patrons of the expanding Humanist ideal. Mary was taught Latin, French, history, philosophy, mathematics as well as all the usual courtly accomplishments of music, needlework, dancing and outdoor pursuits including hunting, falconry and archery. At a later date she is noted as having some knowledge of Italian and Spanish, but it is unclear whether she studied them formally in childhood. The Spanish humanist Juan-Luis Vives, although he was not her actual tutor, drew up a programme of education that was intended to turn her into a model of feminine virtue. It was, of course, still envisaged that Mary would be the wife of a King, rather than a Queen-Regnant herself. In 1522, Henry’s plans for Mary became even grander than a future as Queen of France. Her cousin, Charles of Spain, had been elected as Holy Roman Emperor. Keen to have English support in the interminable struggle between the Hapsburgs and the Valois Kings of France, Charles visited England twice, and it was agreed that he would marry Mary. 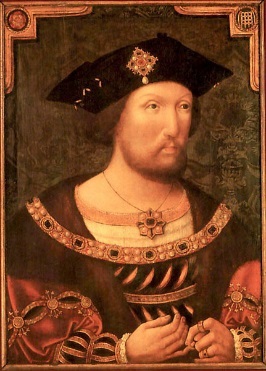 She would be sent to Spain when she was twelve, and Henry, although unhappy that he had no son, could at least contemplate the thought that his grandson might become Emperor.